It is hard to believe I was in the Reynolds Real Mom competition over 5 years ago. Time flies. 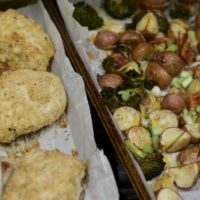 I have updated this post with better photos and tips so you can enjoy an amazing weeknight meal with very little clean up. This Crispy Chicken with Oven Roasted Potatoes recipe were created years before the trend of Sheet pan dinners. Don’t fret about dinner, we have you covered with all these amazing weeknight dinner ideas. I am Maria Long from Close to Home and welcome to my kitchen. I am excited to share with our most favorite and versatile Reynolds product, Reynolds Wrap Parchment Paper. Today I am going to show using Parchment Paper, you how I can make a full dinner, including dessert, with minimum clean up. 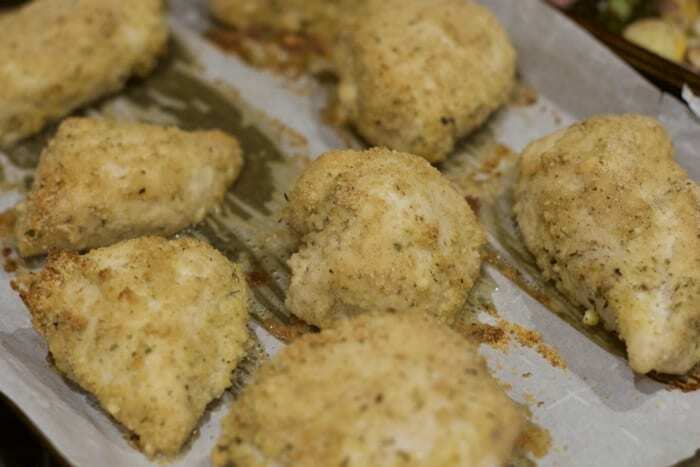 For starters we are making one of our family favorites,Crispy Baked Chicken off the Reynolds Kitchens Website. It is a great alternative to fried chicken. By using Reynolds Parchment Paper on your baking pan you have nothing to clean up. You can prep these chicken breasts while you wait for the oven to heat. Better yet you can prep them the night or morning before and just cover them in the fridge until you are ready to preheat the oven. Just look at all the yummy melted cheese and chicken drippings left on our plan. No worries about scrubbing this off. Just throw away the parchment paper. Your scrumptious main dish is ready to be served! Now for the Sheet Pan side dish. 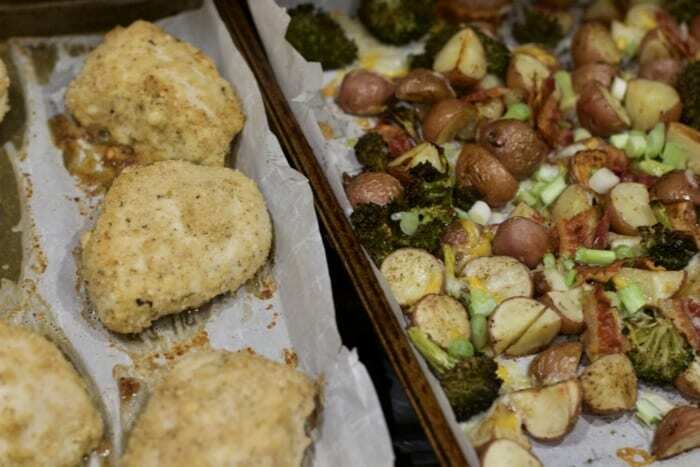 We made the recipes on two separate sheet pans in order to have enough to feed our family of 5. 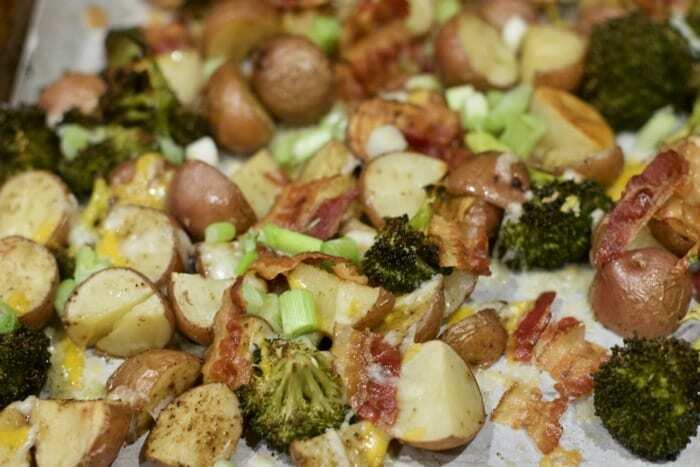 Another wonderful recipe from Reynolds is the Oven Roasted Potatoes. . This is really not a good description for this recipe. It really is like a double stuffed baked potatoes on your plate. How can you say no to Potatoes, bacon and cheese all made on one baking sheet and more importantly watch how it comes off. This would be stuck to any baking sheet and a nightmare to clean up. Not tonight ladies and gentleman, we are getting off easy. It just slides right onto your serving platter. We added some fresh broccoli to our dish to bump up the veggie count. Think you don’t have the time or energy to make dessert tonight? In less than 1 hour you can make this flourless chocolate cake. No frosting involved and made in a single dish. By using parchment paper on the bottom of our cake pan, clean up once again is just rinsing out the pan. It also will just slide out onto your cooling rack, no sticking to the bottom and wrecking your hard work. So as you can see three baking pans is all you need to wash off. No scrubbing or scraping off caked on food. More importantly dinner is served and you are not exhausted. 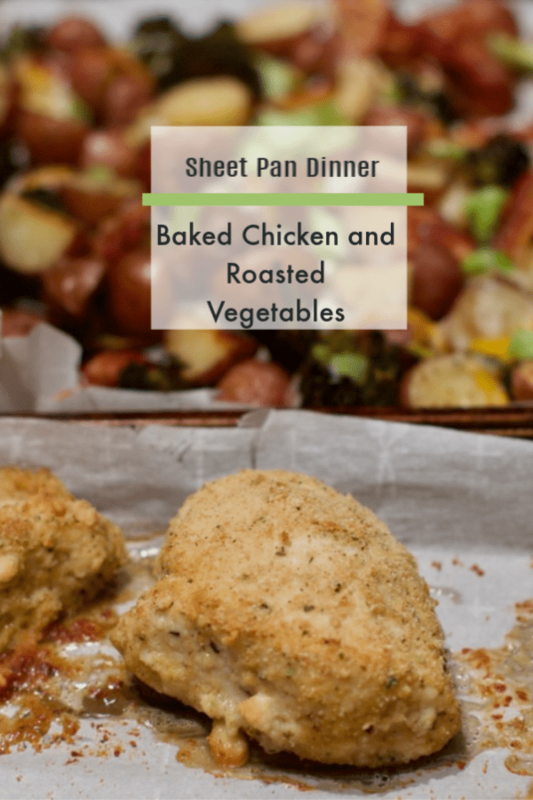 This sheet pan chicken dinner recipe can be assembled the night or morning of the meal. Elegant for weekend night and perfect for busy weekdays. COMBINE eggs and milk in bowl. Combine Parmesan cheese, bread crumbs, Italian seasoning and pepper on a sheet of wax paper. 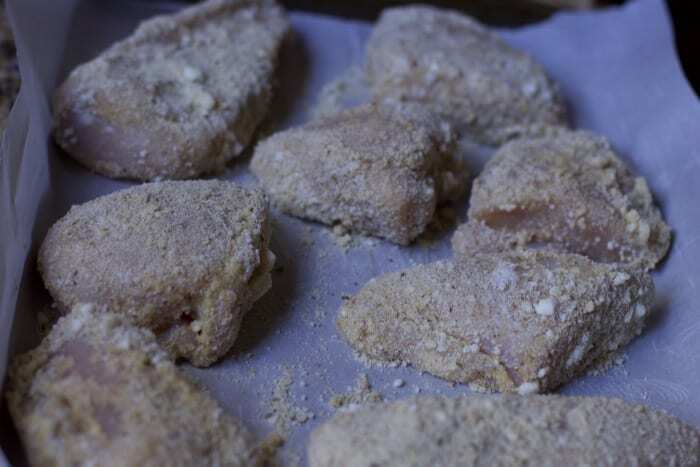 Dip chicken pieces one at a time in egg mixture, roll in crumb mixture, turning to coat evenly. Place in parchment-lined pan. Parchment paper is a must in the kitchen. Around the holidays, I notice that I have the biggest mess. I use this always and clean up is a snap! Thank you for the Oven Roasted Potatoes recipe as well. I can really use that. I’m really impressed how easy clean up can be by using Reynolds products! I need to start using them, I have having to spend hours every week washing dishes this would make my life so much easier! 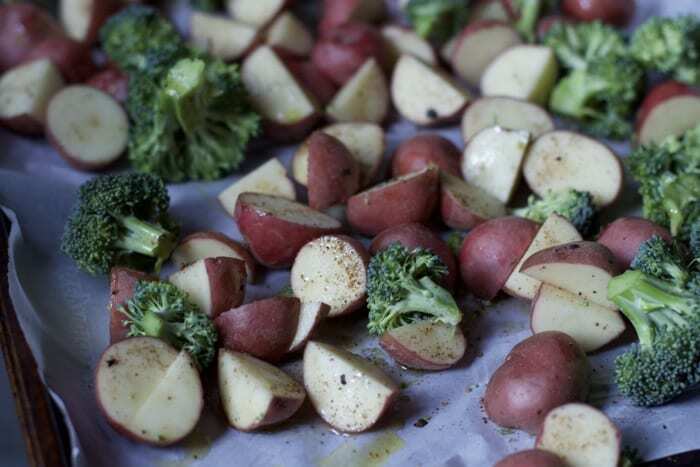 The potatoes and broccoli look great and I plan to make the cake soon. I usually just use parchment paper for making cookies, had not realized it can be used for so many other things making cleaning up so easy. Thanks! we always forget to use it. I use parchment paper for baking and foil for cooking everything else. I love your one pan meal idea. Thanks!